Growing up in Australia, Christmas has always been about shorts, t-shirts and firing a barbie in the backyard. Under 35 degree heat, Christmas wasn’t like the “magical” scenes we often see in the movies. Then I moved to London and I experienced a cold wintery Christmas for the first time… a rugged up in jumpers, beanies, scarves and big coats walking down the London Streets, shop fronts drowned in Christmas decoration, one more creative than the next. Seeing tourists and instagrammers snapping the perfect Christmas memories; sipping gluwein in Christmas markets. That jittering-and-buzzing-feeling-like-a- 5-year-old-on-Christmas-day… was just magical! And Christmas has never been the same ever since!! 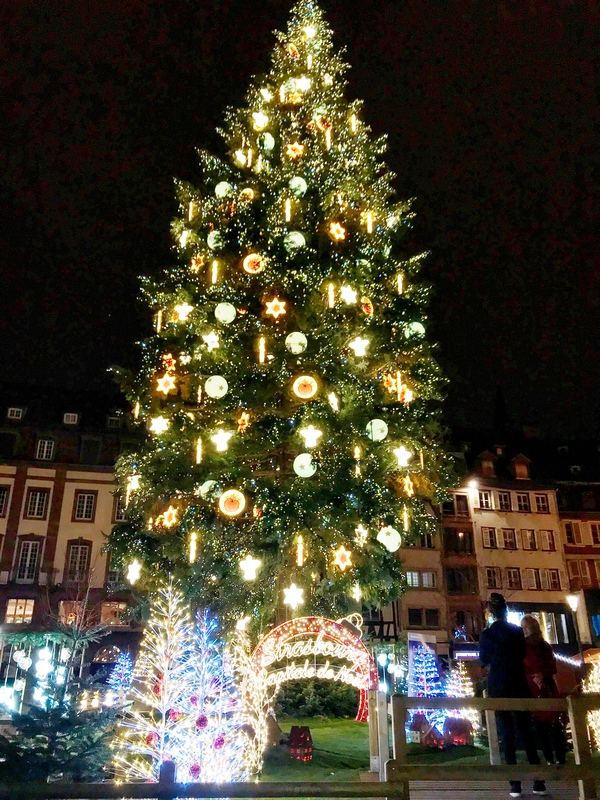 This year, Alan and I got to experience Christmas in Strasbourg, Capitale de Noel (Capital of Christmas). I was like a child in a Christmas fairytale!! After all, they don’t call it the Capital of Christmas for no reason. More-is-More here as far as Christmas is concerned! Building facades, shop fronts, streets are all screaming Christmas. I literally walked everywhere with my head tilted upwards soaking in all the creative and thoughtful decorations. If that is not Christamssy enough, parents our with kids skipping and bouncing about, elderlies walked hand in hand chatting and laughing, tourists stroll through the town and watch people… the whole comes to live during this festive season. Place Kleber is the largest square in the heart of the city. Every Christmas, a giant Christmas tree is placed in the centre of the square surrounded by beautiful buildings and Christmas markets of course. Even more enchanting at night when all the lights sparkle throughout. Strasbourg is reknown for their Christmas markets. It is home to one of Europe’s oldest and largest Christmas Markets with over 300 chalets spread over 11 different locations. They do put on a good show! We literally found a Christmas Market in every corner we turned. The main market is in front of the Notre Dame Cathedral. It is very popular and always packed with people whether its during the day or night. Each year, the Strasbourg Christmas Markets attract over 2 million visitors and I think they were all here! I personally enjoyed browsing through the quieter (relatively) markets in La Petite France. But do come here to admire this Gothic style Cathedral and listen to the bells chime. It is grand! If it wasn’t so cold, I would just sit out in the courtyard and just stare at this all day… and night! Anyway, back to Christmas Markets… If you’re like me, you can spend hours checking out all the different goodies on display at every stall. Even though after our third market, all the stalls were starting to look the same, I still managed to drag Alan through every stall! haha…!! Look at all these snow globes?! I was searching everywhere for a large Christmas in Strasbourg globe. Unfortunately, I only managed to find a small one. Last minute gifts for the little ones…? My favourite part of the exploring the markets is the food spread. I have to admit, having being to the Cologna Christmas Markets, I was expecting there would be more food stalls. However, the Strasbourg markets are less about food and more about the arts and crafts, ornaments, dry food, tea leaves etc. Having said that, we really enjoyed their Bretzel (soft pretzel sprinkled with cinnamon sugar) and the French’s take on sausages with sauerkraut. Wash them all down with a cup of Vin Chaud (mulled wine or Gluwein) or two or three…!! You can get them in this souvenir mug or plastic cup. Of course, I had to have one in a Christmas in Strasbourg mug! If you opt for the plastic cup, you can return it and get your €1 back. If mulled wine is not your thing, how about some hot and steamy mushroom soup? This is the plastic cup they all serve in and don’t forget to return it to get your €1 back. I am in awe at this building’s facade!! And that is a cake shop with the most delicious looking cakes ever! If you want a place to sit, how about this cute restaurant in La Petite France? For our first dinner, we had it at Debit de Vins Sant-Sepulcre. I highly recommend their braised pork knuckle! Perfectly cooked and just melts in your mouth! Wash it down with a glass of sweet Gewürztraminer Vendanges Tardives. Superb! Make sure you reserve a table beforehand as they are super busy. This is the rest of the decorations for the restaurant. This street is the most festive street in the whole of Strasbourg. So after dinner, we walk off the food off along the street and admired Christmas decorations and indulge in the seasonal vibes. Looks like everyone had the same idea as it is particularly busy at night. It is very family oriented as we saw many parents with young children strolling along. These photos do not do them justice. You just have to take my word for it or come see it for yourself next Christmas! Next time I’m going to dine here. It looks so cute and cozy inside! This is my kind of cottage… If only we could stay here! 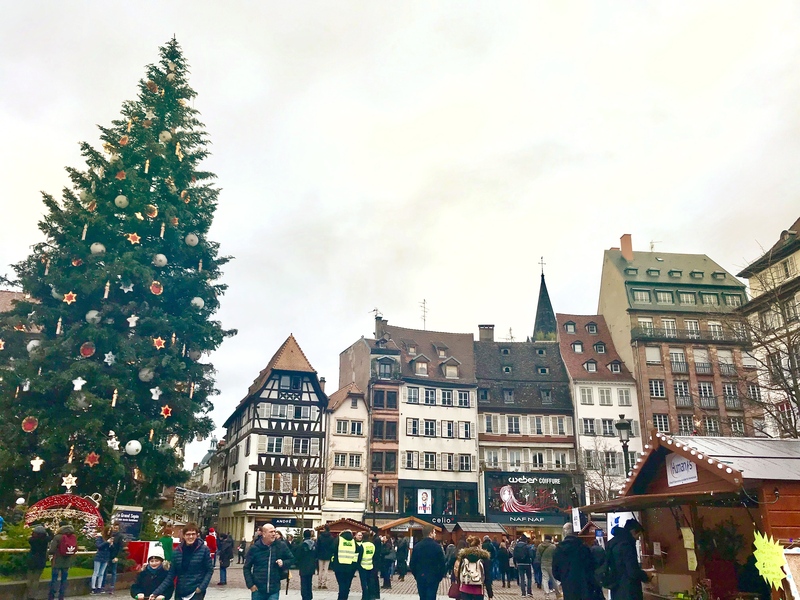 There are plenty more to see and do in Strasbourg besides Christmas Markets and festive decorations such as the picturesque La Petite France, old Market Squares, exploring the bridges, bird’s eye view of La Petite Franc and more…. stay tuned for the next post. 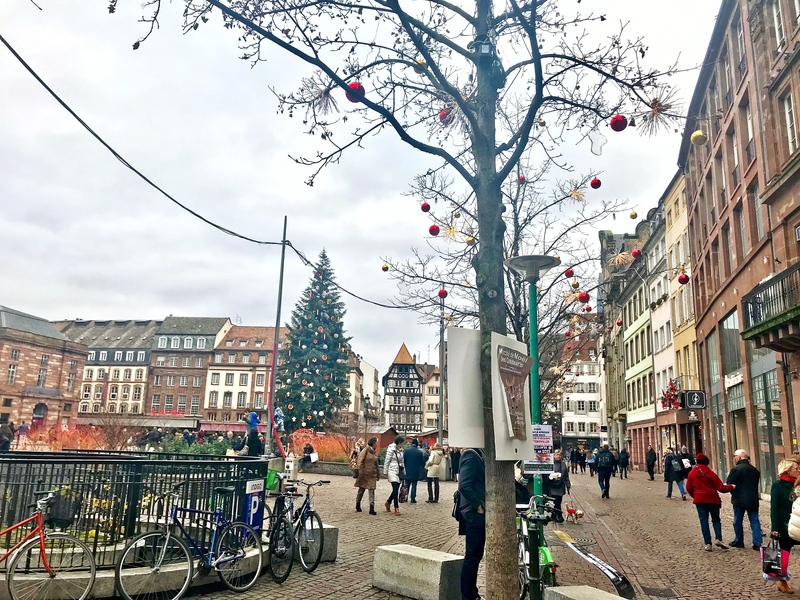 I hope you had an awesome Christmas and enjoyed this Christmas in Strasbourg post. How did you spend your Christmas? Don’t forget to check back in for more adventures in Strasbourg. This is great!! Its great to see different Christmas traditions around the world! Very cool for you to share them with everyone else!! WOW! You have got me excited for Christmas 2018 already! I adore OTT decorations and indulgences, this is my idea of heaven. Glad you felt the wonder of it all. It was lovely to read this post. The pictures are so beautiful, Strasbourg sure is only list now . This post was lovely to read . Strasbourg is sure on my list to travel now.